Perfect for the jet-setter in you! Nykaa Bling It On! Mini Travel-size Makeup Bag is all you need to glam up for your travel plans. 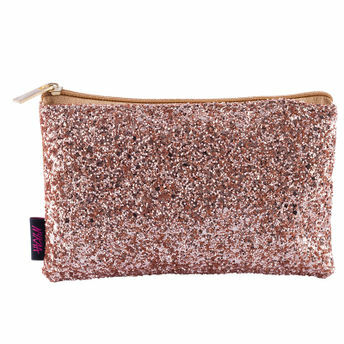 This beautiful sequined pouch comes in a cutesy mini size, which is perfect to store all your essentials. It is secured with an easy-to-use zipper, which keeps your stash safe at all times. Ultra glam in looks and super useful in nature, this mini makeup bag is a must-have in your travel wardrobe. Dimensions: 6 (l) x 2.5 (w) x 4 (h) inches. Explore the entire range of Makeup Pouches available on Nykaa. Shop more Nykaa Cosmetics products here.You can browse through the complete world of Nykaa Cosmetics Makeup Pouches .Alternatively, you can also find many more products from the Nykaa Bling It On! Mini Travel-Size Makeup Bag range.